Kim Skov-Nielsen has come across most things in 37 years working in every aspect of the boating industry. KSN has conducted hundreds of surveys, appraisals and supervised countless complex repairs for yacht owners all over the world. If you're looking for straight talk, an unbiased marine survey and a thorough report delivered quickly and electronically, then you've come to the right place. KSN speaks English, Danish (Norwegian & Swedish), French, German and Spanish fluently. He understands and can make himself understood in Italian and Dutch as well. 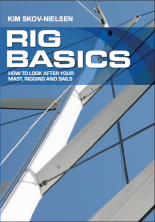 "Kim Skov-Nielsen has raced and sailed professionally worldwide, and his experience enables him to explain rig issues clearly. This book is a must read for every owner and crew."